Women's lacrosse (or girl's lacrosse), sometimes shortened to wlax or lax, is a sport played with twelve players on each team. Originally played by indigenous peoples of the Americas, the modern women's game was introduced in 1890 at the St Leonard's School in St Andrews, Scotland. The rules of women's lacrosse differ significantly from men's field lacrosse. The object of the game is to use a long-handled stick (known as a crosse or lacrosse stick) to catch, carry, and pass a solid rubber ball in an effort to score by hurling the ball into an opponent's goal. The head of the lacrosse stick has a mesh net strung into it that allows the player to hold the lacrosse ball. Defensively the object is to keep the opposing team from scoring and to dispossess them of the ball through the use of stick checking and body positioning. The rules of women's lacrosse are different from the men's lacrosse game. Equipment required to play is also different from the men's. Women are only required to wear eyewear/lacrosse goggles and a mouth guard. The stick has restrictions too, as it must be a certain length and the pocket not too deep. At the collegiate level in the United States, lacrosse is represented by the National Collegiate Athletic Association, which conducts an NCAA Women's Lacrosse Championship each spring. Internationally women's lacrosse has a thirty-one member governing body called the Federation of International Lacrosse, which sponsors the Women's Lacrosse World Cup once every four years. Known as the "fastest sport on two feet," lacrosse is a traditional Native American game which was first witnessed by Europeans when French Jesuit missionaries in the St. Lawrence Valley witnessed the game in the 1630s. These games were sometimes major events that could last several days. As many as 100 to 1,000 men from opposing villages or tribes would participate. Native American lacrosse describes a broad variety of stick and ball games played by the indigenous people. Geography and tribal customs dictated the extent to which women participated in these early games. The first modern women’s lacrosse game was played in 1890 at the St Leonards School in Scotland, where women's lacrosse had been introduced by Louisa Lumsden. Lumsden brought the game to Scotland after watching a men's lacrosse game between the Canghuwaya Indians and the Montreal Lacrosse Club. 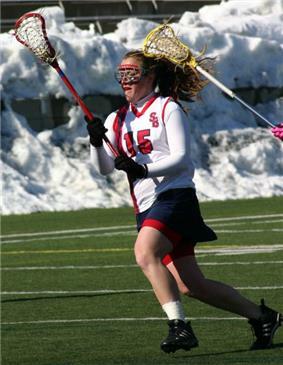 One of Lumsden's students, Rosabelle Sinclair, established the first women's lacrosse team in the United States at the Bryn Mawr School in Baltimore, Maryland. Women’s lacrosse is played with a team of 12 players, including the goalkeeper during usual play. The ball used is typically yellow, unless both teams agree to use a different coloured ball. The duration of the game is 60 minutes, with two halves. Each team is allowed two 90-second team time-outs per game (two 2-minute timeouts in the USA). In the USA, a time-out may be requested by the head coach or any player on the field after a goal is scored or any time the requestor's team is in clear possession of the ball. If a possession timeout is called, players must leave their crosses in place on the field and return to that same place for the restart of play. No substitutions are allowed during this stoppage of play. The rules of women's lacrosse differ significantly from men's lacrosse. The details that follow are the USA rules. International women's lacrosse rules are slightly different. 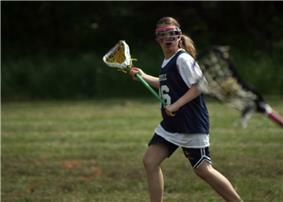 The women's lacrosse game saw numerous rule changes in 2000. Modifications included limiting the amount of players allowed between the two restraining lines on the draw to five players per team. Stick modifications have led to offset heads, which allow the women's game to move faster and makes stick moves and tricks easier. In 2002, goggles became mandatory equipment in the United States (but not a requirement in international rules). In 2006, hard boundaries were adopted. In 2013 the rules for women's NCAA lacrosse changed a defensive rule that made the game more similar to that of the men's. Players in their defending end of the field may run through any portion of the crease (8 meter circle around the goal) as long as their team is not in possession of the ball for as long as 3 seconds. Only the defensive player who is directly marking the ball carrier within a stick’s length may remain in the crease while defending. This rule evolved the game to a point where the defense had more equality in play with both the attackers, and compared to the men's game. Today, under the rules of North America, seven players play attack at one time and seven defenders are present. Generally, a team has four attackers, four close defenders, and three midfielders. There is a restraining line that keeps the four defensive players (plus the goalie) from going into the attack, or four attackers from going into the defensive zone. If those players cross the line and participate in the play, they are considered offside and a major foul is called. Women's lacrosse rules are specifically designed to limit physical contact between players. As a result of the lack of contact, the only protective equipment required are a mouth guard and face guard/goggles.Players have the option of wearing eye protection according to US Lacrosse rules. All players must wear a professionally manufactured intra-oral mouthpiece that fully covers the teeth. The mouthguard must include portions protecting and separating the biting surfaces and protecting the teeth and supporting structures and has to cover he posterior teeth with adequate thickness. No protruding tabs are allowed for field players. In addition, players may choose to wear gloves, and jewelry is not allowed to be worn. Although the rules specify these types of protection, injuries still occur from accidental checks to the head and the overall nature of the sport. Players must wear composition or rubber soled shoes. No spikes are allowed. Plastic, leather, or rubber cleats-studs may be worn. Shoes and socks are not required to be identical for team members. The pockets of women's sticks are shallower than those of the men, making the ball more difficult to catch and to shoot at high speed. The pockets also make it harder to cradle without dropping the ball. There are two different surroundings around the goal on both sides of the field; the eight meter arc and the 12 meter fan. When committing a major foul inside either of these areas, the offense regains the ball and has a direct opportunity to goal. If outside the 8-meter arc, but inside the fan, a "lane" to goal is cleared of all other players and the person who committed the foul is relocated 4 meters behind the offender. If inside the 8-meter-arc and a defensive foul occurs, all players that were previously inside the surrounding must take the most direct route out. The player who was fouled now moves to the nearest hash mark that is located around the edges of the arc and has a direct lane to goal. The defender who committed the foul is relocated on the 12-meter fan directly behind the shooter. If a player fouled another player not in the arc, the victim receives the ball and the player who fouled must back away at least 4 meters. All other players standing closer than 4 meters to the ball holder must also back away to give the girl room to move with the ball. Women's games are played in two 30-minute halves (two 25-minute halves for high school varsity). These 30 minutes periods are running time (may be stop-clock after goals in USA rules), except for the last two minutes, during which time stops when the whistle is blown. While the whistle is blown, players must stand in place. In women's lacrosse, players are not allowed to intentionally touch the ball with their body to gain an advantage or cover the ball to protect it from being picked up by an opponent. Should a tie remain after regulation, state high-school associations can choose to break the tie using two 3-minute periods of extra time. If the game remains tied after the two periods of extra time, the teams will then play 3-minute golden goal overtime periods until one team scores, which wins them the game. The "draw" is what starts the game and keeps the game going after a goal is scored. The draw is when two girls, one from each team, stand in the center circle with the backs of their sticks facing each other. Then the referee places the ball between the two sticks. Each player has to push their sticks together parallel to the ground to contain the ball. There are allowed four players from each team ( two Midfielders, one Attack wing, and one Defense wing)to stand along the circle surrounding the center circle during the draw. The players’ sticks around the circle cannot break the line until the whistle is blown. The centers must lift and pull their sticks over their heads releasing the ball. The yellow card is for a first-time penalty and results in the player being removed from the field for three minutes. In the U.S.: any player receiving two yellows sits out the rest of the game but is allowed to play in the next game. Every four years, the Oshawa, Canada, in 2013. The United States defeated Canada in the final. The next World Cup will be held in Surrey, England in 2017. 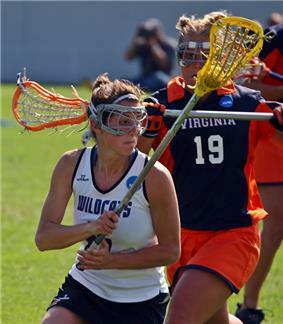 Katie Schwarzmann, two-time winner of the Tewaaraton Trophy, member of United States women's national lacrosse team. Kristen Kjellman, two-time winner (2006, 2007) of the Tewaaraton Trophy. Jen Adams, head coach for the Loyola Greyhounds of Loyola University Maryland and All-American lacrosse playerfor the Maryland Terrapins of the University of Maryland, College Park. ^ Vennum, Thomas (2007). Lacrosse Legends of the First Americans. JHU Press. p. 2. ^ "History of Lacrosse at St Leonards". STLeonards-Fife.org. Retrieved 2008-05-01. ^ "History of Bryn Mawr School". brynmawrschool.org. Retrieved 2008-07-18. ^ "Women's Rule Changes for 2000". LaxPower. Retrieved 2007-03-18. ^ a b c d e f g h i j k l "Women's Condensed Lacrosse Rules". Fisher, Donald M. (2002). Lacrosse: A History of the Game. JHU Press. p. 361. Pietramala, David G.; Grauer, Neil A.; Scott, Bob; Van Rensselaer, James T. (2006). Lacrosse: Technique and Tradition. JHU Press. p. 300. Tucker, Janine; Yakutchik, Maryalice; Kirk, Will; Van Rensselaer, James T. (2008). Women's Lacrosse: A Guide for Advanced Players and Coaches. JHU Press. Vennum, Thomas; Vennum, Jr., Thomas (2008). American Indian Lacrosse: Little Brother of War. JHU Press. p. 376.